I give Deep Ellum Brewing Company some credit here. Their art department comes up with some awesome looking labels, and cans. 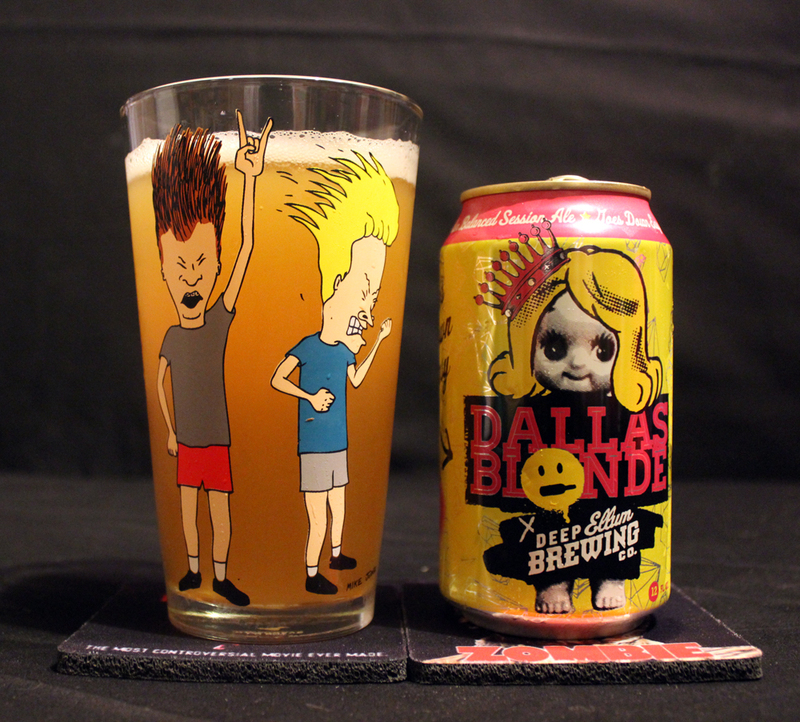 Dallas Blonde is no exception. This can has an eye catching bright yellow and pink color scheme going on with a cool looking artsy looking doll head with blonde hair and a pink crown or tiara. They also use a lot of what looks like graffiti or spray paint like artwork throughout the entire can. Very punk rockish! What better way to enjoy this beer than to use my Beavis & Butthead pint glass! This beer poured a beautiful bright cloudy yellow color, almost matching the can color. The beer also had a nice finger wide white bubbly head, which retains quite well, leaving good lacing down the glass. The aroma of this beer was also very pleasing. It had a good crisp nose with smells of citrus hops, such fruits as pear, or even white grapes, but very faint. There is also a present grainy maltiness mixed in, giving this beer an all around bouquet of aroma. The taste of this beer is also pleasing. The combo of the citrus, floral hops really help this beer stand out from the other Blonde Ales I have had. Some Blondes are too grainy, or malty, but Dallas Blonde might have those characteristics in the taste, the combo of the hops thrown in keep this beer well balanced and enjoyable. There’s not a whole lot of complexity here, just a good recipe with some excellent brewing skills. The body is a good medium thickness, and the mouthfeel is smooth and creamy, with a good carbonation bite to it. I believe you can see that I really enjoy this beer, and I can not wait to get my hands on some more. I have had the pleasure of having a few of the Deep Ellum beers, and so far these guys are pretty impressive. I see a lot more great things to come from them. Metal Connection: Seeing as this Brewery is from Dallas, TX, I wanted to choose a Dallas based band that I also highly enjoy. I went classic Thrash Metal on this one with RIGOR MORTIS and my favorite track from their self titled debut full length album from 1988. Movie clip from the movie, Re-Animator is also used as an intro to this song, and that is also one of my favorite movies! Hope you enjoy this classic song again or for the first time!